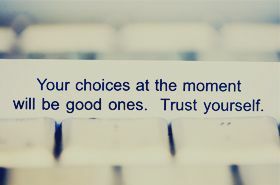 Deciding not to choose is choosing, so choose wisely. Do not be victim of circumstances. You have three choices. Let it define you. Let it destroy you, let it strengthen you. Choice is yours. Dreaming is easy. To realize which one's worth pursuing is the most difficult to choose. There are choices you have to make not just once but every time they come up. Choices are made by human beings, based upon their likes and dislikes. Choices, regarding any particular thing vary from person to person. For example, when it comes to colours, some people end up liking black, some red, some others blue and so on and so forth. Thus, choices are basically relative. Choices of any person, at times, reflect his bent of mind, education and his several details. Similar choices of people go a long way in making them feel comfortable and even compatible with each other, at times. But when it comes to making ethical choices, Besil Huna has rightly puts forth that," Moral choices do not depend upon personal preference but on right reason and, I would add divine order". Thus, some choices should be driven by pure reason, wisdom and ethics. Choices should be made after finding the details of any matter, rather than without any logic.